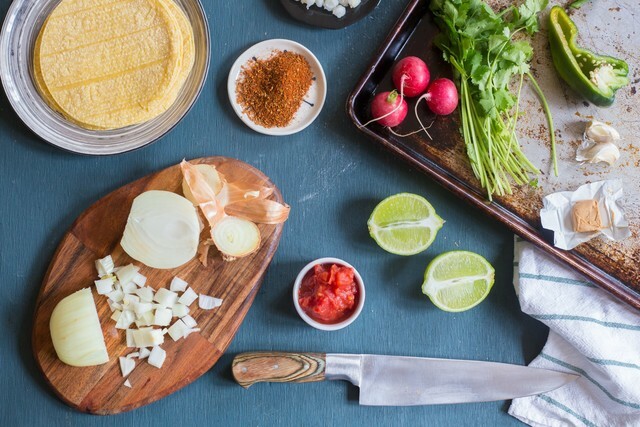 Whether you're one of the 29 million people diagnosed with diabetes in the United States or simply looking to limit your carbohydrate intake, finding recipes that are both delicious and nutritious - without a lot of starch or sugars - can be difficult. Fresh produce may seem hard to come by in the winter months, but that's not so: hearty greens and lettuces, naval oranges, and root vegetables like carrots, potatoes and radishes are all in abundance and ready for your dinner table. 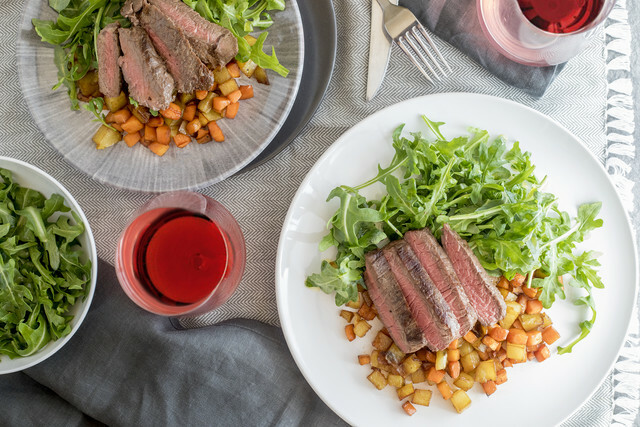 Combining the forces of our stellar culinary and nutrition teams, PeachDish has developed several recipes that are lower in carbohydrates and loaded with satisfying flavors that'll turn your Winter dinner into a winner! This is plant-based weeknight comfort food at its finest. It’s warm and rich, not heavy or boring – the “butter” is actually miso, which is made from fermented soybean and famous for its satisfying, savory flavor. The addition of mushroom and bitter greens adds even more umami to the dish, while a bright and spicy radish salad balances everything out. 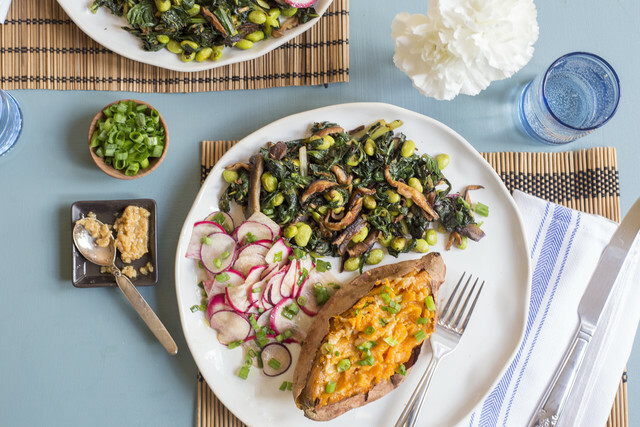 Feel free to add either side directly to the sweet potato; they both complement its natural sweetness beautifully. 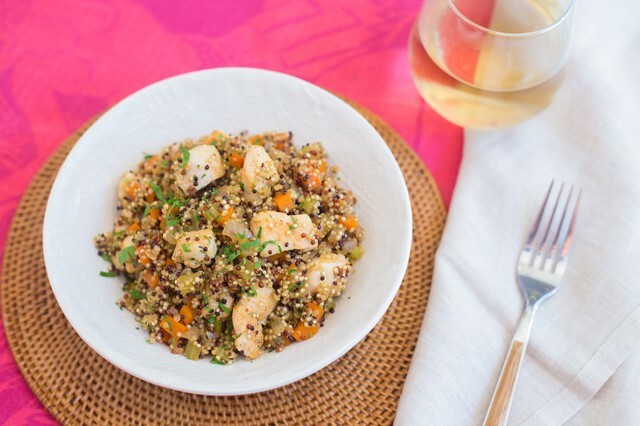 With white, red and black (actually deep brown) quinoa, carrots and parsley, this beautiful one-pan meal reflects the colors of the season. 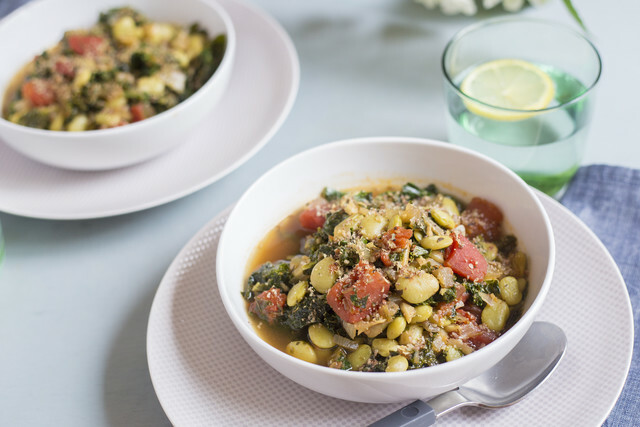 The flavors, too, are as comforting as a pot of chicken soup – except this dish fills the plate, and tummy, with high protein quinoa. Cozy up to your sweetheart with this vegetarian take on classic stroganoff. 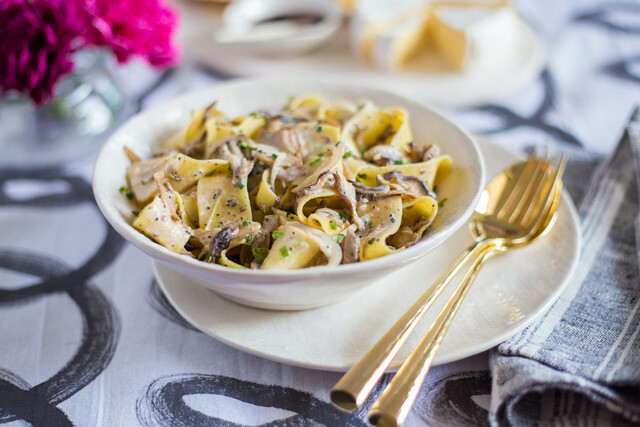 Earthy mushrooms and rich egg noodles bathe in a tangy sour cream sauce, while poppy seeds spark the palate with every forkful. This dish is part of our Date Night kit bundle - order now through Sunday, February 10th to get yours delivered in time for Valentine's Day! 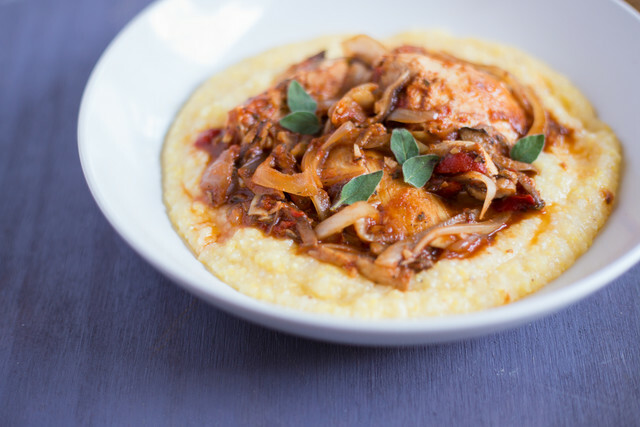 Chicken cacciatore is a dish prepared “hunter’s style,” that is, with the hunter’s wild catch and any herbs and vegetables the hunter gathers along the way. This version is made with a blend of mushrooms, roasted red peppers and oregano, and served over buttery yellow polenta for a meal that’s savory and satisfying, and so quick to put together. This baked version of a traditionally pan-fried supper offers all of the flavor with less fat. A kick of Cajun seasoning in the crispy cornmeal coats the flaky fish to retain all of its moisture. 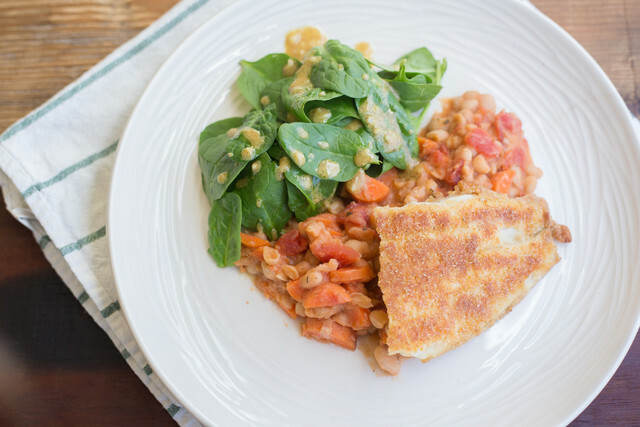 It’s served over a hearty bed of carrots and beans, and a tangy spinach salad provides a bright counterpoint. 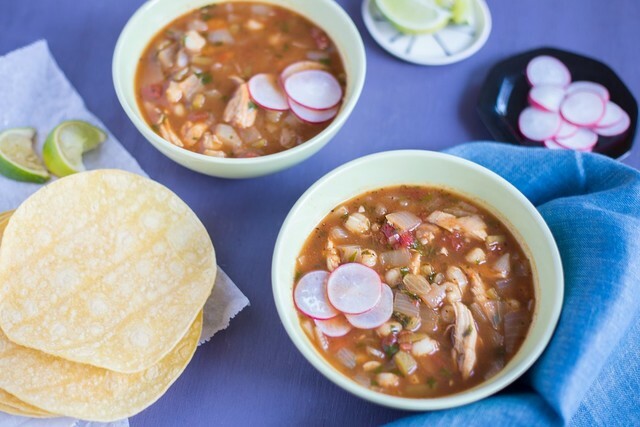 Pronounced “Po-SOLE-eh”, this traditional Mexican soup is usually eaten for holidays or special occasions, but the bright flavors of citrus and spice in a warm bowl of hearty soup are worth celebrating any night. The featured ingredient, hominy, is made via nixtamalization, a process in which dried corn is soaked in an alkaline solution, such as limestone and water, to soften the hulls. Hominy actually appears twice in this meal: in whole kernels in the soup, and ground into masa for tortillas. 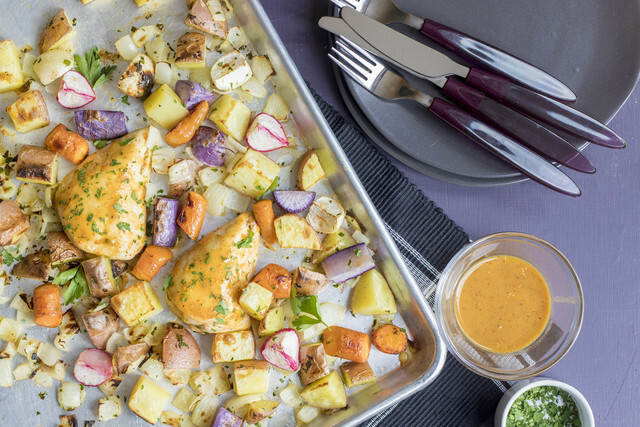 Winner winner, sheet-pan chicken dinner! This meal is quick to prepare and requires little dish duty afterwards. Bold mustard sauce from Southern Links BBQ is mixed with the citrus zest and fresh-squeezed orange juice before serving as a glaze for chicken breast. Earthy, seasonal root vegetables roast alongside the chicken until all are tender and flavorful, and the aroma of sage wafts through the kitchen. 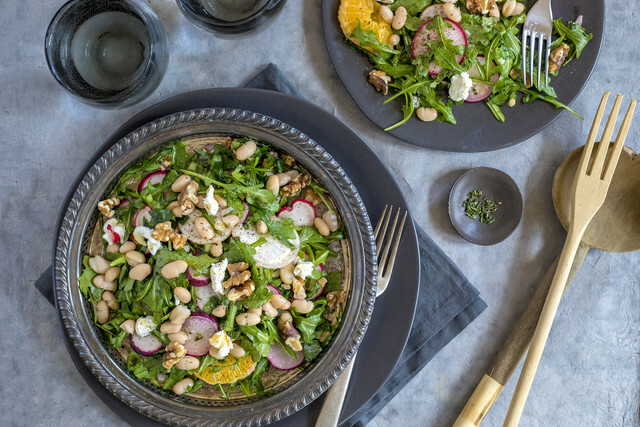 By the time winter winds down, we crave something that tastes sunny - such as this gorgeous entrée salad of sweet, juicy oranges and crisp, peppery radishes. The crowning glory is a generous crumble of tangy goat cheese and crunchy walnuts drizzled with honey and sprinkled with cracked pepper -- a flavor combo you’ll crave again well before the warm season rolls in. We believe everyone deserves a place at the dinner table, regardless of their dietary preferences, which is why PeachDish works to incorporate a weekly menu balance that includes both Southern classics (ahem, Comfy Chicken!) and nutrient-dense, Heart-Healthy fare, bursting with fiber, vitamins and minerals, and flavor while being limited in calories, saturated fat and sodium. We also offer No Gluten Added and Vegan dishes! As always, all the nutrition information for any of the present or past menus is available on the website for you to explore. Happy eating, y'all!